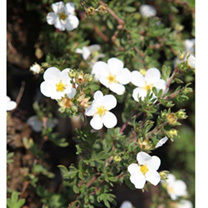 Potentilla Nuuk is an evergreen perennial. The dark glossy leaves create a stunning contrast with the pure white flowers that open from late spring. A small low growing shrub that is ideal in a rockery or to provide ground cover at the front of a border. Height 50-60cm. Supplied in a 3 litre pot. Ideal for beds and borders, patio pots and containers, rockeries, ground cover. Prefers full sun or partial shade.